Welcome to 'Fine Lines', the Friday feature in which we give a sentimental, sometimes-critical, far more wrinkled look at the children's and YA books we loved in our youth. This week, writer / reviewer / blogger Lizzie Skurnick rereads 'From The Mixed-Up Files of Mrs. 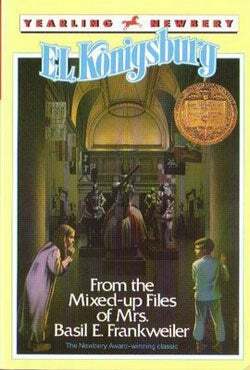 Basil E. Frankweiler', E.L. Konigsburg's 1967 novel about extremely unaccompanied minors run amok at the Metropolitan Museum of Art. Claudia knew that she could never pull off the old-fashioned kind of running away. That is, running away in the heat of anger with a knapsack on her back. I miss New York. Not the New York somewhere over to my left. A New York before The Squid & The Whale brought divorce to the Museum of Natural History. A New York before nannies got groped; a New York before private-school girls intertwangled lustily on beds in some benighted plan to rule the school. It was a New York that had room for a notepad-toting minor to spy unaccompanied on people through dumbwaiters; a boy to wander Chinatown having adventures with a cricket; teenagers to contend with a genie in a mystery at the Cathedral of St. John the Divine. Not a world where children playact adult dramas, or unhappily contend with the chaos adults leave in their wake. It's a New York that keeps adults perpetually at shoulder-level, briefcases and purses jostling, while the children, front-and-center in the frame, get up to whatever children get up to. The children in question are one Claudia and Jamie Kincaid, Greenwich-residing, grammar-school-aged siblings. (Re: In an earlier Fine Lines comment thread, an admitted pedant pointed out that FTMUFOMBEF is technically middle-grade, not YA. Since as far as I can tell, these categories exist primarily for schoolteachers, booksellers, and award-givers, Fine Lines will from now on define "YA" as any book read in one's own company from the time one learns to read to the time one pays one's own rent.) The children's getting-up-to entails one very long, unauthorized stay in the Metropolitan Museum of Art, where they come upon a statue of an angel which may or may not be carved by Michelangelo — and this, as they say, changes everything. She didn't like discomfort; even picnics were untidy and inconvenient: all those insects and the sun melting the icing on the cupcakes. Therefore, she decided that her leaving home would not be just running from somewhere but would be running to somewhere. To a large place, a comfortable place, an indoor place, and preferably a beautiful place. And that's why she decided upon the Metropolitan Museum of Art in New York City. ....But not entirely. Claudia knew that it had a lot to do with injustice. She was the oldest child and the only girl and was subject to a lot of injustice. Perhaps it was because she had to both empty the dishwasher and set the table on the same night while her brothers [Preach it! —Lizzie.] got out of everything. And, perhaps, there was another reason more clear to me than to Claudia. A reason that had to do with the sameness of each and every week. She was bored with simply being straight-A's Claudia Kincaid. She was tired of arguing about whose turn it was to choose the Sunday night seven-thirty television show, of injustice, and of the monotony of everything. More on that in a minute. That interpolater is, of course, Mrs. Basil E. Frankweiler, in the form of a letter to her lawyer, Saxonberg, who is also, we eventually find out, the children's grandfather. In the grand epistolary-meets-omniscient tradition, Frankweiler is in possession of more knowledge that Claudia, both about the Angel she's sold to the museum, and about Claudia herself. But more about that later! First, the Met. ...she lay there in the great quiet of the museum next to the warm quiet of her brother and allowed the soft stillness to settle around them: a comforter of quiet. The silence seeped from their heads to their soles and into their souls. They stretched out and relaxed. Instead of oxygen and stress, Claudia thought now of hushed and quiet words: glide, fur, banana, peace. Even the footsteps of the night watchman added only an accented quarter-note to the silence that had become a hum, a lullaby. Because, as Claudia begins to realize, she has come to the museum not only because she is sick of being the old Claudia, but because she wants — needs! — to return to Greenwich a different Claudia, a Claudia who has bigger concerns than keeping her whites and colors separated, brushing her teeth, and correcting her brother's grammar: "An answer to running away, and to going home again, lay in Angel," she thinks. ...."The statue just gave me a chance...almost gave me a chance. We need to make more of a discovery." "So do the people of the museum. What more of a discovery do you think that you, Claudia Kincaid, girl runaway, can make? A tape recording of Michelangelo saying, 'I did it?" Well, I'll clue you in. They didn't have tape recorders 470 years ago." "I know that. But if we make a real discovery, I'll know how to go back to Greenwich." "You take the New Haven, silly. Same way we go here." Jamie was losing patience. "That's not what I mean. I want to know how to go back to Greenwich different." Jamie shook his head. "If you want to go different, you can take the subway to 125th Street and then take the train." "I didn't say differently, I said different. I want to go back different." ..."Claudia, I'll tell you one thing you can do different..."
"Oh, boloney, Claude. That's exactly it. You can stop ending every single discussion with an argument about grammar." "I'll try," Claudia said quietly. ....Claudia's excitement flowed not bubbled. I could see that she was a little surprised. She had known that Angel would have the answer, but she had expected it to be a loud bang, not a quiet soaking in. Of course secrets make a difference. That's why planning the runaway had been such fun; it was a secret. And hiding in the museum had been a secret. But they weren't permanent; they had to come to an end. Angel wouldn't. She could carry the secret of Angel inside her for twenty years just as I had. Now she wouldn't have to be a heroine when she returned home...expect to herself. And now she knew something about secrets that she hadn't known before. Claudia's childhood innocence isn't some walled-off tomb, and it doesn't end unceremoniously when it's tragically shattered by some awful experience. Indeed, the vision of childhood in Mixed-Up Files is that of a museum at night, filled with secrets to uncover, and the freedom to find them unencumbered and alone. When Claudia finds the answer to just one of those secrets, she's not only "different" — she's become, like the Angel, a singular entity with her own history, her own mystery. And when she leaves the museum, she's also leaving her childhood, like some abandoned violin case filled with gray clothes, triumphantly behind. Hi all! We had almost no takers and no winner for last week's challenge, which involved a green marble egg chochke and an appalling dearth of accompanying information. I'm becoming convinced it might have been an English edition of It's Not The End of the World, or something, because you know how wild the English are about those marble green eggs. Too bad, but the challenge is still open to a winner at any point, so if the answer occurs to you later, egg me away. What's the book with a redhead on the cover that is about a relationship and occurs ENTIRELY in one-line paragraphs, basically? I think it's followed by a flip book where the boy also gets to discuss the relationship. As always, answer in the comments below or email jezziefinelines@gmail.com. Be first or be worst! A special treat for this week's winner: you will also receive a copy of the 75th anniversary edition of Little House in the Big Woods! (Only Continental US for that one, sorry. The Fine Lines pocket is linty and filled with holes, for the most part.) You can also email wishes, comments, suggestions, complaints, and epistolary novels to the email above. Rest assured, I file each and every email in a row of big cabinets and label them for maximum difficulty.